Investing money can be tricky if you don’t know where to begin. Every time when you want to invest money million-dollar question arise that where to invest money? Today multiple investment options are available in market with different specifications. Choosing right investment option which can provide you safety and good return is challenge. In order to overcome this challenge many people approach financial experts or advisors. Many small investors cannot afford fee based services and select investment option on their own. To help these types of investors we have come up with article which will show you how equity, debt and gold had moved in past 20 years. Inspiration for this post is recently published article in “Economic Times”. According to the details published fixed deposit has generated more return than equity since 1992. Most of people find it contradictory because we perceive something else. You might be thinking how this is possible? Or You might remind me about famous quote which says “In God we trust, everyone else must bring data”, so to prove this point we have extracted historic data from BSE, RBI & article of economic times to show how Fix deposit, Sensex and Gold has performed since last 20 years. Pictorial Presentation given above is clearly shows you how amount invested under Sensex, FD and Gold has grown over the past 20 years. Sensex was quoting 4,285 on 31st March,1992 and on 31st March, 2012 it was quoting 17,404.So amount invested under stock market has given annualized return of 7.26%. 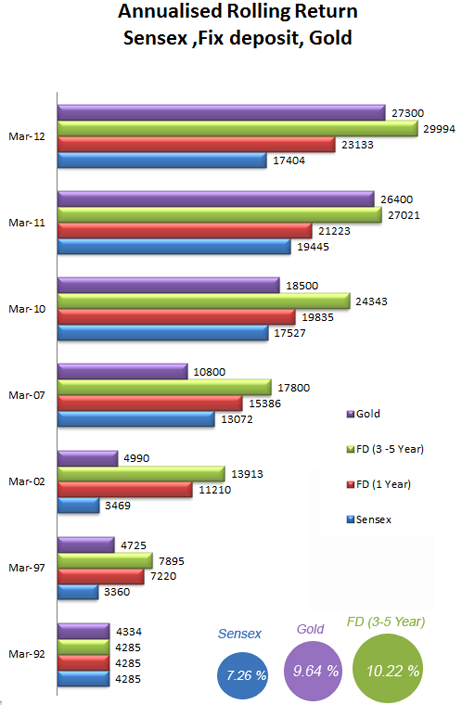 10 gm Gold was quoting Rs 4,334 on 31st March, 1992, if you have purchased 10 gm gold at that time then, it would have grown to Rs 27,300 on 31st March,2012. If we calculate annualized return over 20 years then it comes out to be @ 9.64%. Now consider case of Fix deposit if you have invested equal amount (Rs 4,285) in FD (3-5 Year) and rolled over this FD year on year after 20 year then, it would have grown to Rs 29,994,the annualized return over 20 years come out to be 10.22 %, more than return of Sensex . This doesn’t mean that you should clear your investment from equities. You need to change your perception that you will always get good returns if you hold equity investments for a very long time. 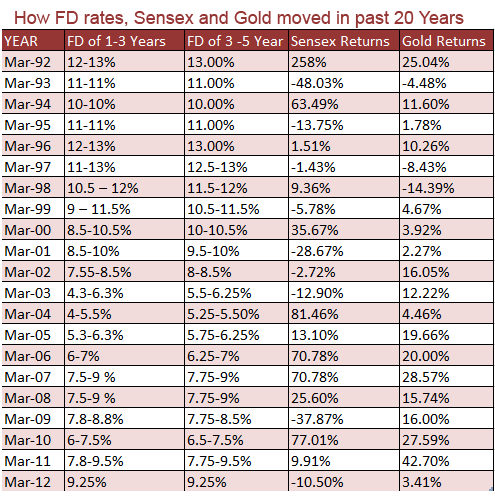 Above table shows how FD, Sensex and Gold moved in past 20 years in terms of returns. 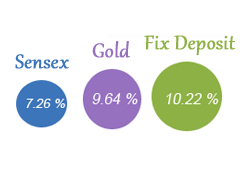 Over past 20 years Sensex has given 9 time negative returns, whereas Gold has given 3 time negative returns. So, Take away is if you invest in equity and don’t monitor/ assess returns effectively it may end up giving you negative returns, where FD gives you guaranteed positive returns. Many investor adopt strategy of “Fire and forget missile”. Don’t adopt this strategy if you invest your money for long term especially in equity. Another point is equity investments are always risky. Knowledge and timing is very important for dealing in stock market, if you are not master in that it’s better to invest FD or in mutual funds through SIP. Please note that FD attracts Income Tax which is not considered in above example. Purpose of this post is not for marketing of FD, We only want that don’t buy and forget if you invest in stocks for the long term. Don’t forget to add your comments on this post. Long term period is usually considered 5 years or above but definition of long term varies from person to person. I do agree that sometime over a 1 year sensex has given 70-80% return but to person who has correctly acted and taken appropriate decision for buy or sell. Long term is a period which is not clearly defined. As you yourself pointed out, investing in stocks for a period of a yr has generated returns of 70-80% at times. it is important for an investor to know when to invest and when to exit the market. It is also important to take a look at your portfolio every once in a while and sell the stocks which are not going to give returns. I agree with you that it is all about keeping a track of your investments. if you don’t then you will lose money. As simple as that.